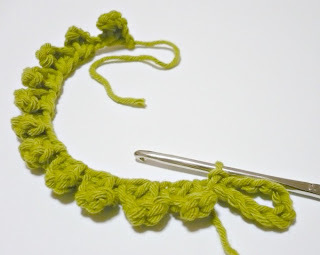 1) With green yarn and 3.5mm crochet hook, (ch5, sc2tog twice), forming the first petal. Repeat ( ) for as long as is required for the length of the bracelet. My bracelet measures 5.5 inches/13.97 cm long, consisting of 11petals. Remember to make this bracelet just fitting your wrist at this point since we are going to add a button loop which will increase the length of the bracelet slightly. 2) Continue to ch10. Bring the chain back to the starting ch and slip stitch into the first starting ch, forming the button loop. 3) Join cream yarn. 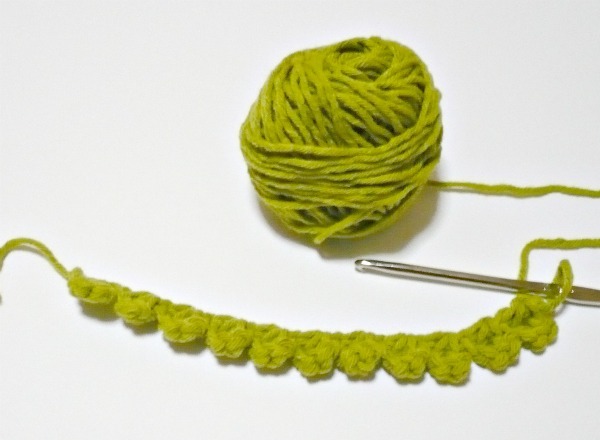 DO NOT cut off the Green yarn yet. Sc along the edge of the green crocheted piece evenly, right to the end. Cut off the cream yarn and weave in all ends. 4) Go back to the green yarn still attached. Now start to slip stitch in each cream yarn sc, right to the end. Cut off the green yarn, leaving a tail of about 8 inches. Thread this tail yarn onto a yarn needle and attach a button onto the piece. Please do not redistribute/sell this pattern or post it anywhere online. You may link to this blog post if interested :) Thank you! The way you have explained the tutorial of this bracelet is very impressive. Dear Amy Lin, Another nice pattern; thank you for sharing! 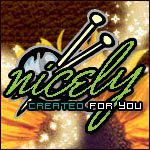 I wanted to let you know that I made 3 of your nice mice and put a link on my blog. If you like you can take a look! Dear Amy Lin, thanks a lot for your nice response!